The AIGS was founded in 1978 ( Asian Institute of Gemological Sciences ) like the GIA the AIGS was originally founded for the educational studies on Gem stones and diamonds. 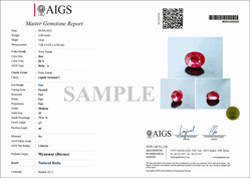 Today the AIGS is regarded as the world leading authority on Gem stones along with the GIA. They are based in Bangkok in Thailand, Thailand is responsible for 80% of the words supply of gem stones whether the gem stones were mined in Asia to Australia Thailand has become the biggest market for the trade and sale of gem stones in the world today, for these reason you will find many of the worlds top geological laboratories have offices their including the GIA. 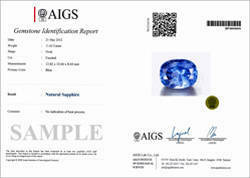 The AIGS has become the first place for certifying any high value or rare gem stone with cutting edge technology they have being the first port of call for the most famous of gem stones indentation including the millennium sapphire found in Madagascar in 1986 which is the largest natural sapphire in the world today. 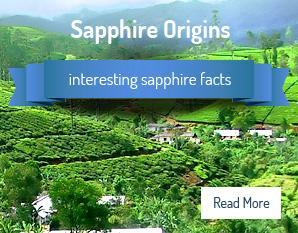 *Please note that a brief report is carried out using the same testing than a full report, brief reports have become the standard for buying sapphires in larger quantities as they are easy to keep with each sapphire. 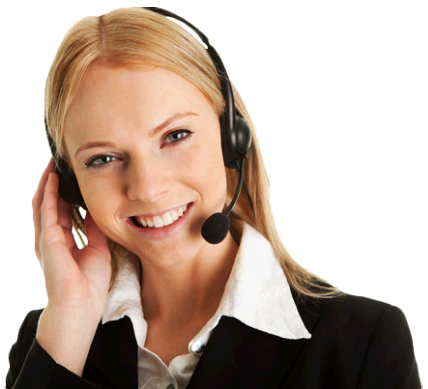 Please contact us at Sapphire Ring Co at any time with any questions you have on the AIGS.